All for just 70 calories a slice. This recipe is without a doubt one of my most popular recipes, not just during the holidays but all year round. And yet, the original Crustless Pumpkin Pie recipe was published so long ago (back in 2012 – feel free to make fun of that old post if you read it) that many have probably missed seeing it completely. I wanted to update the original recipe—taking new photos and doing my first ever video!—to give one of the most popular recipes on the blog the recognition it deserves so it won’t be lost in the archives. I call the recipe “Impossible Pumpkin Pie” because it magically sets up without any crust at all! 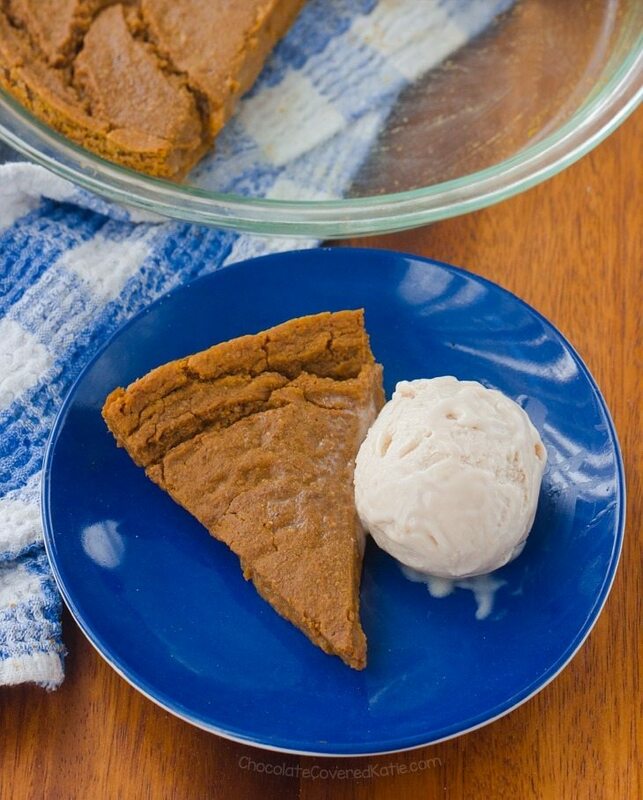 This is a “one bowl” pumpkin pie that takes literally just minutes to prepare – stir the ingredients together in the bowl, smooth into a round pan, and wait for the magic. It will come out of the oven all soft and deliciously custard-like. 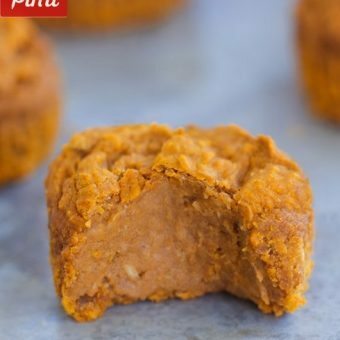 The recipe can be egg-and-dairy-free, gluten-free, vegan, and completely free of refined sugar; yet it’s something even people without any dietary restrictions can also really enjoy. And the nutrition stats are stellar, with over 100% of the RDA for Vitamin A in just one slice of pie. Served with my favorite Banana Ice Cream Recipe. I used the vanilla option for the ice cream recipe, because the only thing better than whipped cream and pumpkin pie is ice cream and pumpkin pie. 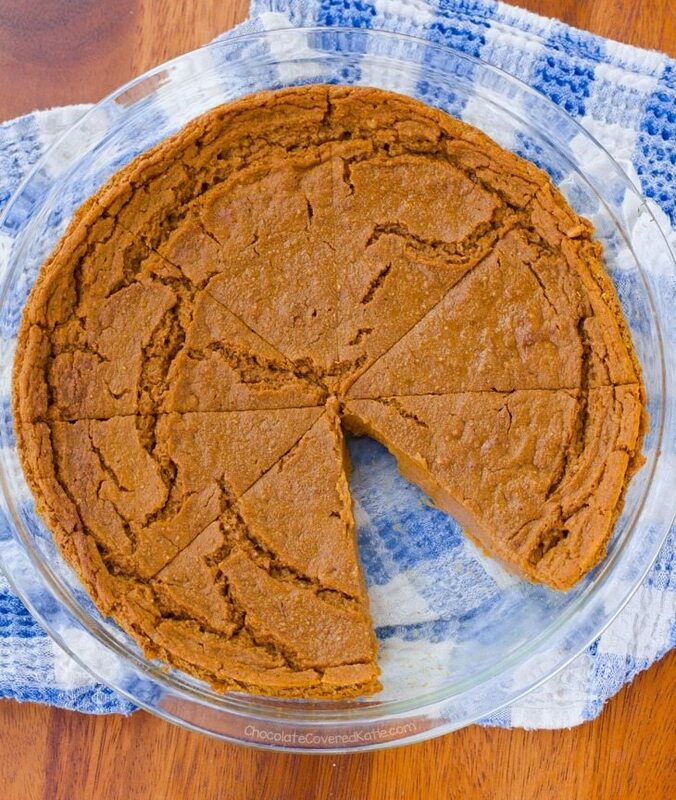 With such a fantastic nutrition profile, going back for seconds of this crustless pie is strongly encouraged! I’m one of those people who firmly believes just a single slice of pumpkin pie is never enough and always look forward to dessert at Thanksgiving much more than the meal. 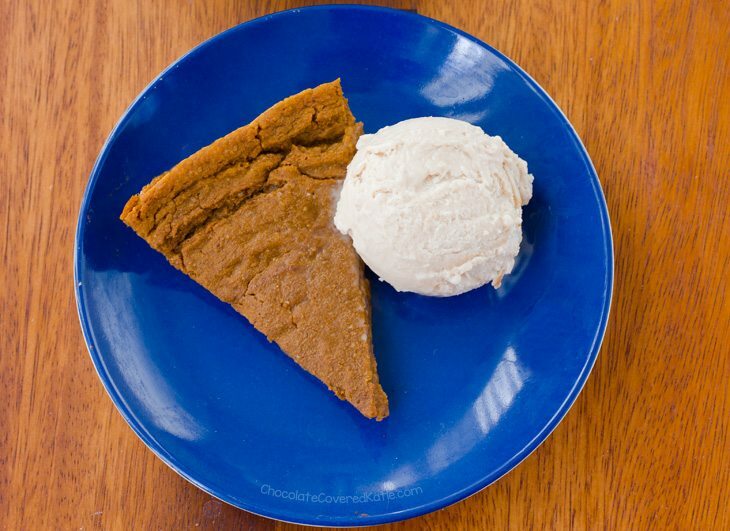 There’s no way green beans and mashed potatoes can compare to homemade pecan and pumpkin pie. Then again, I know my sister would disagree with me. She was always most excited for the mashed potatoes. And please feel free to let me know your thoughts on the video – Are videos something you’d like to see more of in the future? I’m late to the video train but had a surprising amount of fun making this one. It helps that my camera didn’t fall into the pie as I was filming, which sadly did happen when I filmed the video for my Ultimate Vegan Cheese Sauce. 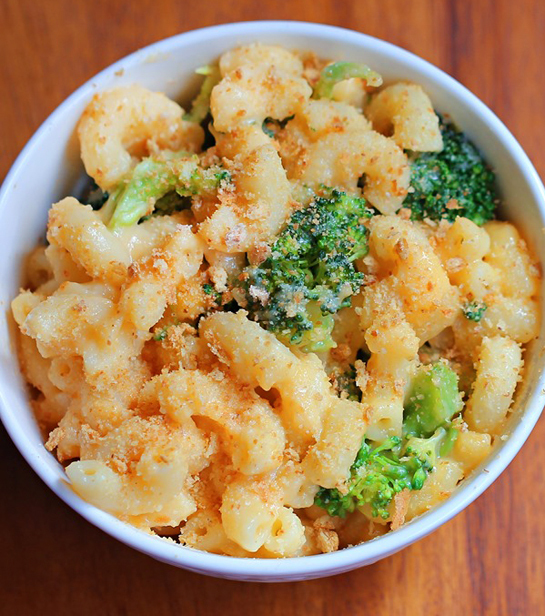 Anyway, if you haven’t seen today’s recipe before, I hope you love it as much as I do! *The pie will be a bit delicate (less firm) without the final optional ingredient, which is fine as long as you handle it with care or wish to serve it in a bowl. Preheat the oven to 400 F. Grease a 9-inch round pan. In a large bowl, stir together all of the ingredients (For most even results, I like to add the ingredients in the order shown in the video). Smooth into the prepared pan. Bake on the center rack 35 minutes – it will be super-soft after baking, which is what you want. Allow to cool completely before transferring, uncovered or only loosely covered, to the fridge to “set” for at least 6 hours. Slice and serve. Store leftovers covered in the fridge for 3-4 days. I would try googling a cups-to-grams conversion chart online. Then you can just input the ingredients. Or look on the labels of the ingredients you use, as it usually will say how many grams are in a serving size and you can go from there. Baking time may change, but why not? Report back if you do! I like the video! It shows how easy making this really is, and for trickier recipes it can also show desired consistencies or how to mix a specific ingredient in. Good job! Love this and the video!! I did try the 2012 recipe last year and loved it, so I will most definitely be giving this one a shot as well. 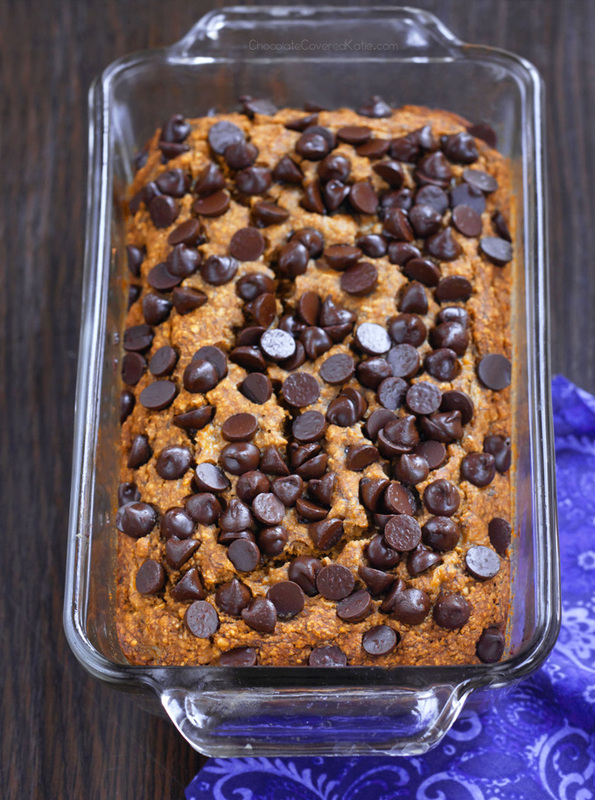 After making your pumpkin snack cake to RAVE reviews, I trust you with all things pumpkin;) This looks so gooey and delicious!!! Yum! I’ve been reading your website for awhile, and I definitely love it. I think videos can be useful, as another commenter mentioned, but please don’t do only videos. You can’t print out the recipe from a video, and seriously, I personally will never take the time to watch the video. and what is in pumpkin pie spice-I can’t get that. You can use extra cinnamon instead. Or google how to make your own pumpkin pie spice (it’s just a mix of other spices). When I click on the link View the Recipe Video, it only brings me back to this page and no video appears (I’m using Explorer). Does anybody else have the same Problem? The video is working for me, but we cleared the cache anyway – is it working for you now or still disappeared? I really like reading your blog and appreciate your recipes. However, considering this is your full-time job, couldn’t you have tried to make a more professional video? This reminds me of the early days of food blogging. It’s sort of embarrassing. Sorry. Why do I some how doubt you’ve actually ever tried to make a video yourself and would rather just leave nasty comments about ones someone else made? You do realize the Buzzfeed Tasty style videos cost up to $1,500 per video to produce, right? Its harder than it looks and I don’t think your nastiness is very helpful here. Arielle go away, you and your nasty messages, nobody wants you here nor do we need you here. You and your rude messages —go away!!! Your video is GREAT Katie! It’s quick and provides an excellent vantage point of what it will look like. Exactly what I want in a video. Thanks for the healthy recipe!! 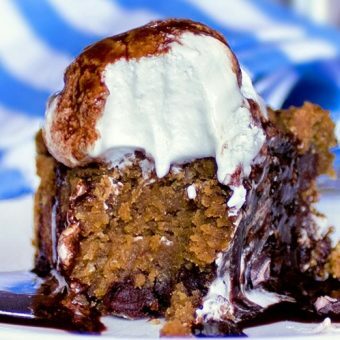 I am literally going to make this recipe tonight! We love your pumpkin cheesecake bars and also have the creme brulee on the to do list. 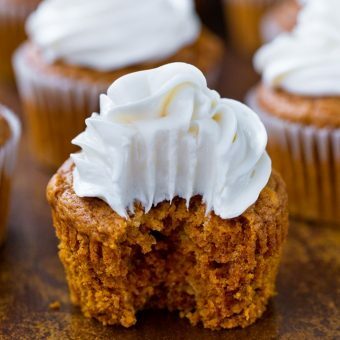 Really one can’t have too much pumpkin! I did not watch the video- are the ingredients in the printed version (online/email) in the same order that you should add them? Typically, this is how recipes are listed. I can’t watch the video at this time so it doesn’t help me. Katie, we don’t have canned pumpkin here in Australia (that I am aware of!!). If I used pureed butternut pumpkin should I strain it before using to make sure it is not too wet. That should definitely work! 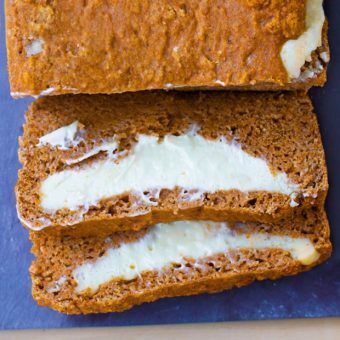 You can also use sweet potato. Katie!! Love this recipe and the video!! Unlike Arielle, I think the video was VERY professional and well-made! Please keep making videos, as other commenters have also remarked that it is very reassuring to know how the texture and order of ingredients are supposed to be like when making a recipe! And I would love to see videos of older recipes as well!! Cough cough all the brownie recipes!? I love this recipe and your video! 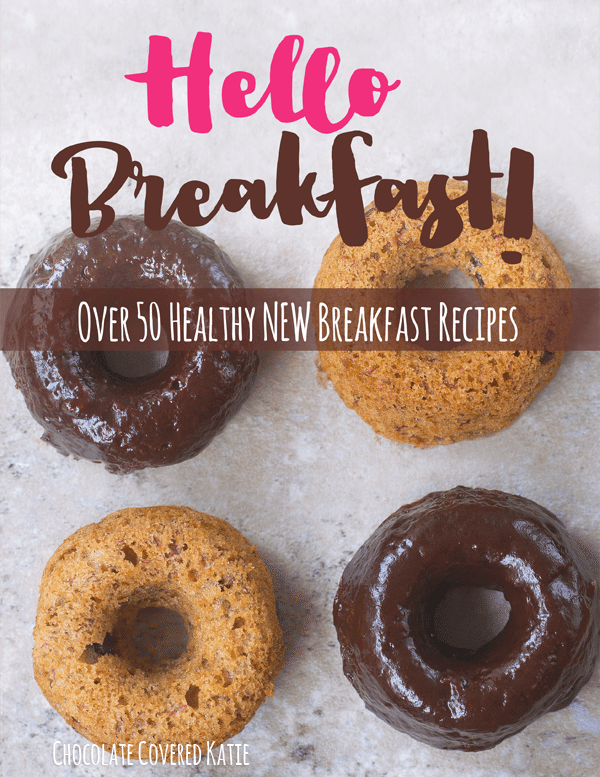 Katie- love your blog and your cookbook! I think the video is simple and great- it fulfills its purpose. It shows what we need to see: Ingredients, What it should look like, How easy and minimal the effort. Thank you for all your hard work! Look forward to trying this pie! Are they unnecessary or do we assume they are in with the spices? Also, I’ve always wondered why food bloggers (not just you) don’t use rubber scrapers? They are quieter, incorporate better and get every last drop of yummy goodness out of the bowl. I think she probably just used a spoon because it’s what was on hand at the moment. No real reason I can think of that someone wouldn’t use a spatula other than that.